Similar to bold prints, leopard print is a great way to add a little flair to any outfit and you can make it as bold or as subtle as you want! I have a leopard print scarf that I seriously wear with everything and it is a great way to elevate any look. I am obsessed with the cut and fit of the blazer, as well as the black trim--also appropriate for all seasons! the sweater is such an interesting take on leopard print and i love that it is combined with leopard loafers! if you want a more demur splash of leopard just go for the loafers. 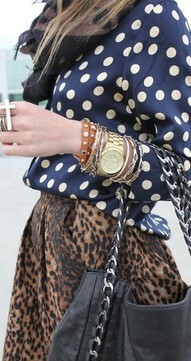 leopard and navy is a wonderful combination! i also love the pleats and the snake skin belt. what a daring and subtle way to combine prints. you can't go wrong with a sheer belted leopard dress. this would be perfect for the spring and summer and just pair it with a blazer or leather coat to transition to fall. love this bag and it instantly makes the outfit more interesting. also, how fab are those heels? leopard adds another dimension to this look. i also love the collar! such an amazing and unexpected combination! love love love love! the accessories are pretty great too! more navy and leopard. easy, comfortable, and fashionable. i also love that the sweater is layered over the skirt (or dress). Anna Dello Russo (editor-at-large for Vogue Japan) is my fearless fashion hero!